Since a Libyan military commander launched an assault to take over Tripoli, the capital, 10 days ago, 121 people have died and 561were wounded, the World Health Organization said Sunday. 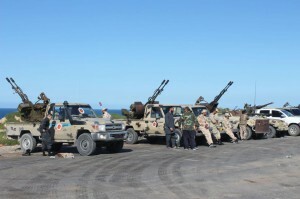 Vehicles and militants, reportedly from Misrata, gather to join Tripoli forces, in Tripoli, Libya, on April 6. Khalifa Haftar, the commander of the Libyan National Army, ordered Libyan forces loyal to him to take the capital Tripoli, held by a U.N.